In this age of complex regulatory oversight and wide ranging threats to corporate data, securing a company's information assets from internal and external threats has become a primary focus and concern for information professionals. IBM® understands these requirements and using features of the System z® hardware platform, DBMS and operating elements for DB2® on z/OS®, and Information Management tools can help to provide a defense in depth which can help to provide information confidentiality, integrity, and availability. We start with a description of the data governance requirements, with an emphasis on IBM Data Servers Blueprint including the IBM Data Server Security Roadmap, and general elements of a complete governance approach. Next, using the elements described in the first section, we position and map the specific elements and requirements of the Blueprint based scenario to IBM portfolio of security solutions. We then focus on some specific elements and capabilities of DB2 for z/OS and System z platform. These capabilities include elements such as network roles and trusted context, exploitation of network encryption capabilities with SSL and IPSec, and native DBMS Encryption. Included are System z hardware and z/OS operating system elements. Having laid a solid foundation with the previous components, we then take a deeper look at two specific IBM Information Management tools solutions. 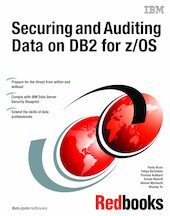 We build scenarios that demonstrate the use of the IBM Audit Management Expert for DB2 for z/OS. We take a deep dive look at the IBM Encryption Tool for DB2 and IMS Databases, including an exploration of the new functionality which provides coexistence with DB2 hardware assisted compression.